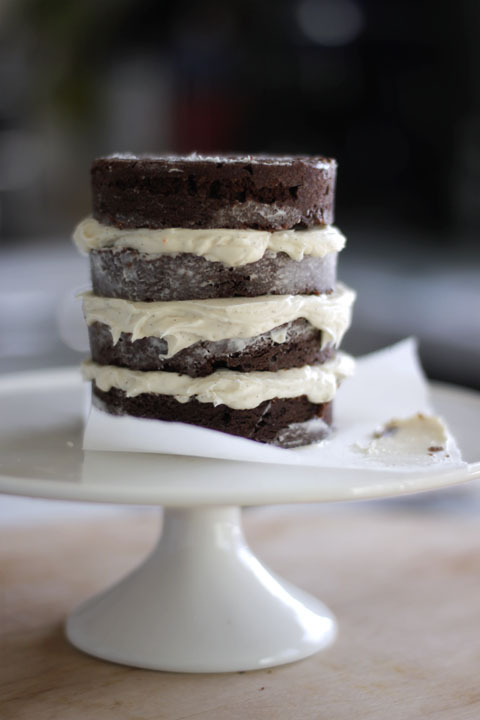 Chocolate Cake with Vanilla Buttercream — always with butter. I love the look of a simple frosted cake. Just smooth sides, completely flat top, minimalist perfect. I think after seeing too many cheesy grocery store sheet cakes that just look so dated and not my style. Going to many patisseries in Paris, even though I was only there for a few days and that was 5 years ago. I still can remember exactly what I had at each one, how they looked, tasted and all the other pastries I wanted to try but there were just too many for my short visit. There is really nothing like that where I live. Its a land of prepackaged desserts, sheet cakes and everything seems to come in a plastic container. I have to drive an hour into the city to get anything remotely close, San Francisco has some amazing bakeries, but its just not the same. So thats why I really want to be able to frost a cake in a smooth even layer. Like super classy looking. It will be the start to me teaching my self to make pastries like the ones that fill my memories of Paris. Did anyone see 'Kings of Pastry'? Amazing movie, and what I wouldn't give to go to that pastry school in Chicago. I school dedicated to only making the spectacular desserts that I always wished I could do? Too amazing. I wish I had the money. This is as smooth and even as I could do. And to get this took... FOREVER. I'm happy with how it turned out and kinda love how it just fits in the palm of my hand. So hopefully after lots of practice, I will be able to do a normal sized cake. And guess how long it took me, from start to finish on this cake? 5 hours! Yes it only bakes for 35 minutes, and of course there is cooling time, but I spent like over 2 hours trying to get it smooth. Frost-smooth-chill-frost-smooth-oops not smooth-smooth-chill and so on and so on. 97 years old. Crazy huh? She's my great great Aunt. It seems like it just takes practice and patience. Well I'm normally lacking on the patience aspect. If any of you little bakers out there have any tips on getting a smooth cake, let me know! And I will let you know if I figure out any tricks! Butter and flour a 9 inch loaf pan or 5-6 small ramkins. Cream butter and sugars for 3 minutes, until smooth and fluffy. Add egg then buttermilk and vanilla. Sift in the flour, cocoa, baking soda and salt. Stir, do not over mix. Pour into pan and bake. 35 minutes for small ramekins, 50 minutes for loaf. Time varies on pan size, so keep checking and test with a toothpick until it comes out clean.